Sequential dissociation of hydrazine has been studied on Ni4 cluster applying density functional theory (DFT) methods. Two routes of dissociation have been discussed. The first path (A) is the consecutive dissociation of four N–H bonds to form surface N2 via intermediate product diimide, N2H2. The second path (B) is the dissociation of N–N bond to form two NH2 species leading to formation of surface ammonia. The second elementary steps for both the routes show the highest activation energy barrier; for example in path A, N2H3 + H → N2H2 + 2H, EAct is 1.19 eV and in path B, 2NH2 → NH + H+NH2, EAct is 1.71 eV. These are the rate-determining steps. NBO analysis shows that adsorption of hydrazine and ammonia is due to strong delocalisation of the lone pairs to the higher energy states of the cluster. Adsorption and dissociation of hydrazine and ammonia are thermodynamically feasible at standard conditions. Formation of N2 is a slow exothermic process, whereas N–N bond dissociation to form two NH2 species is a faster and highly exothermic process. NH species binds by two Ni–N covalent bonds. N species binds the cluster by three Ni–N bonds and three strong lone pair delocalisation at three-fold site. Removal of these intermediates needs higher energy of activation. Thus, the formation and dehydrogenation of ammonia are slow and lengthy processes. New catalysts could be designed in such a way that N–N bond might not be dissociated, which is happening due to absence of lone pair of N1(LP) to Rydberg orbital of N2(RY*) delocalisation or vice versa. The online version of this article ( https://doi.org/10.1007/s42452-019-0392-9) contains supplementary material, which is available to authorized users. Nowadays, fuel cells are considered as non-conventional and renewable source of energy, but the commercial application of fuel cells is limited due to higher price and lower availability of platinum electro-catalysts, which are used for their excellent catalytic property and high resistance in acidic medium. Recently, the demand for cheaper metallic electro-catalysts, viz. nickel, cobalt or alloys, e.g. Ni–Co, Ni–Fe, etc. [1, 2, 3]., and hydrazine-based fuel cells, viz. anion exchange membrane (AEM), direct hydrazine fuel cell (DHFC), room-temperature hydrazine–air direct-liquid fuel cells (DLFC) [4, 5, 6], have made them promising candidates for their excellent performance, lower cost, higher conductivity and longevity. Hydrazine is C-free hydrogen-rich (15.5 wt%) high power density fuel, available in liquid form at room temperature, which can be used as an alternative source of hydrogen instead of hydrogen itself. Hydrazine-based fuel cells can be used in vehicles due to higher cell potential, e.g. + 1.56 V in air–hydrazine cell. The cell reaction takes place in 40–80 °C and produces higher power density than hydrogen fuel cell (5400 W h L−1) . In alkaline medium, the anodic cell reaction for hydrazine is N2H4 + 4OH− → N2 + 4H2O + 4e−. To understand the cell reaction mechanism, several studies have proposed that electro-oxidation of hydrazine on noble metal catalysts takes place through catalytic breaking of N–H bonds, which cannot be identified experimentally due to fast electro-oxidation of the surface hydrogen [8, 9]. But the mechanism of non-faradic or electron-less decomposition reactions, N2H4 → N2 + 2H2 (complete dissociation) and 3N2H4 → N2 + 4NH3 (incomplete dissociation) are also important, which depend upon the catalyst and reaction conditions [10, 11, 12, 13, 14, 15, 16]. Many investigations have been carried out throughout the decades to understand the mechanism of adsorption and dissociation of hydrazine on transition metal surfaces both experimentally and theoretically. Some earlier DFT investigations reported that both gauche and trans-hydrazine preferentially adsorbed on top site, whereas cis isomer liked to adsorb on bridging site of Pt(111)  and Ni(111)  surfaces. Also, trans- or anti-conformer was found to be the most stable geometry vis-a-vis cis and gauche isomers on these surfaces. However, experimentally, Alberas et al. identified by XPS that both the N atoms are adsorbed on the same site on Pt(111) surface and N–N bond is parallel to the surface, suggesting retention of N–N bond and favouring dissociation of N–H bond. Till now, full understanding of bonding nature of hydrazine with Ni catalyst is not clear. Huang et al. identified NH3, N2H2, H2 and N2 species on Ni(100) surface experimentally on a temperature-programmed reaction spectroscopy (TPRS) at 90 K and pressure at 7.4 × 10−11 Tor. Several mechanisms for the dissociation of hydrazine have been proposed. Sequential dehydrogenation of hydrazine with the formation of adsorbed N2H3, N2H2, N2H and N2 species on metal surfaces is shown in several studies [19, 21, 22]. In contrast, some authors [16, 21, 23, 24] reported N–N bond breaking taking place to form two NH2 species which lead to the formation of N, N2, H2 and NH3, and proposed that formation of ammonia can slow down cell efficiency [25, 26, 27]. Zhang et al. studied adsorption and dissociation of NH3 on Ni13, Ni12Cu and Cu13 clusters and observed that the processes are exothermic. But why formation of ammonia reduces the cell efficiency is yet to be understood. Although pure hydrazine is toxic, hydrated hydrazine (N2H4·H2O) is less toxic and considered as a potential source of hydrogen (8 wt%). However, it deactivates pure nickel metal due to the formation of surface N as nitride. On the other hand, Ni-based bimetallic catalysts, such as Ni–Pt, Ni–Ir and Ni–Rh, etc., can perform 100% selective H2 conversion at moderate conditions [29, 30, 31, 32, 33, 34, 35, 36, 37, 38, 39, 40, 41, 42]. Although several catalysts have been designed for 100% selective dehydrogenation, which route is favourable for hydrogen generation—H–N bond dissociation pathway or N–N bond dissociation pathway—remains unclear. Yin et al. generated hydrogen from hydrazine monohydrate with 52% selectivity applying nickel nanoparticles on carbon support and proposed theoretically that both N–H and N–N bond breaking pathways operate to form N2 and NH3, respectively, on Ni(111) surface at different surface coverages. Presently, the demand for cheap nanomaterial-based fuel cells is increasing, and to understand the reaction mechanism on nanoparticles, study of adsorption and dissociation of fuel molecules on small clusters is important . 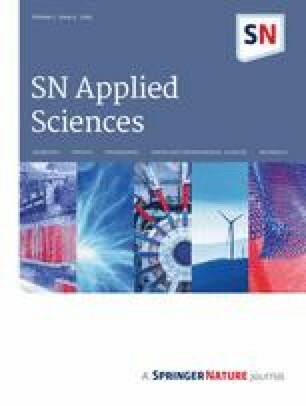 In recent decades, application of nickel clusters or nanoparticles from diatomic to bulk has evoked wide interest both experimentally and theoretically due to their better catalytic and optical properties, high conductivity and lower cost than other noble metals [45, 46, 47, 48, 49, 50]. For example, Xu et al. experimentally obtained 100% conversion of hydrous hydrazine to hydrogen applying Rh–Ni nanoparticles of Rh/Ni ratio 4:1. Oliaee et al. proved that octahedral Pt–Ni/C nanocatalysts having greater stability, durability and selectively can convert hydrazine to H2. Recently, small cluster-based theoretical studies are very important to understand the mechanism of surface reactions at molecular level. For example, Pelegrini et al. studied the dissociation of hydrazine on tetrahedral Pt4 cluster via NHNH3 and N2H5 intermediates as a model to understand the reactivity of hydrazine on surface of platinum nanocluster-based electrodes. Gordon et al. reported hydrazine dissociation applying tetrahedral Ir4 and prismatic Ir6 clusters supported on small alumina slabs, e.g. Al6O9, Al8O15, Al10O16, etc. as a model of Shell 405 catalyst. However, several small Ni4 cluster-based calculations are also reported to clarify the decomposition of small molecules on such surfaces [55, 56, 57]. To our knowledge, the dissociation of hydrazine on Ni4 cluster has not been reported till date. 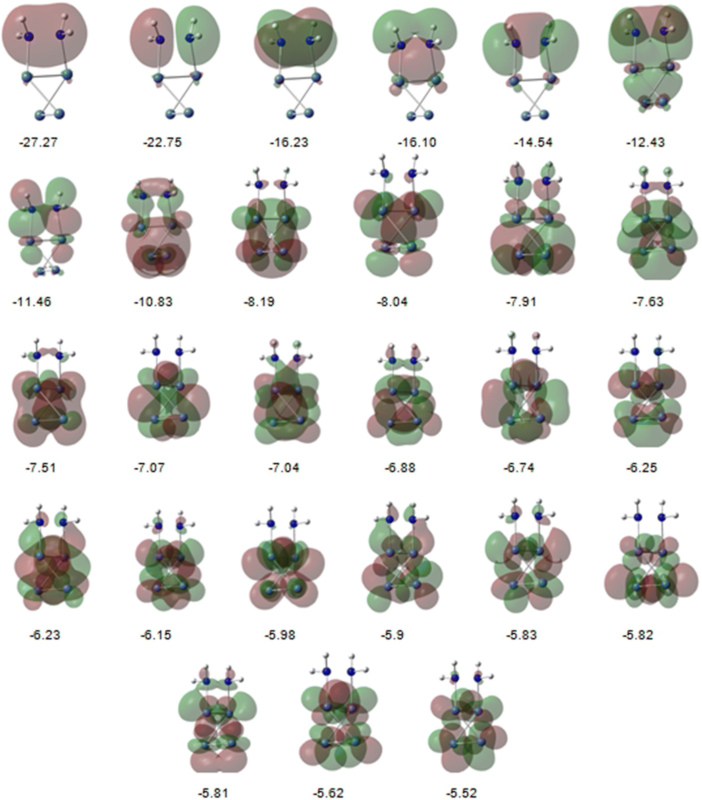 Adsorption and dissociation of hydrazine on Ni4 cluster have been studied in the present work applying density function theoretic (DFT) methods. This is justified by earlier theoretical and experimental results. Two pathways of dissociation have been introduced. The complete mechanism of sequential dissociation of hydrazine may involve elementary steps which are represented and discussed at molecular level applying ab initio molecular orbital theory and natural bond order (NBO) analysis. Formation and dissociation of the intermediate product NH3 are also discussed with corresponding energy values. Geometry optimisations were performed at the generalised gradient approximation (GGA)  using Perdew–Burke–Ernzerhof (PBE) [59, 60] exchange correlation functional in Gaussian 09W package . Geometry optimisations were confirmed by the number of imaginary frequency values to be zero. For Ni atom, the Los Alamos National Laboratory basis set of double-ζ quality (LANL2DZ)  was used, and the corresponding scalar relativistic effective core potential replaced the inner-shell electrons. 6-311+G(3df,2p)  basis set is used for N and H atoms. During optimisation, all the atoms were relaxed. The three-dimensional tetrahedral Ni4 cluster is used as a model to understand the reactivity of hydrazine at molecular level on surface of Ni catalyst particle. The optimised geometrical parameters of Ni4 cluster is presented in our earlier papers [56, 57]. However, to obtain stable configuration of adsorption, different possible adsorption configurations were optimised by placing the conformers of hydrazine on the binding sites of Ni4 cluster, as shown in Fig. 1b. Pelegrini et al. used LANL2DZ basis set in B3LYP [64, 65], MO6 [66, 67] and PBE [59, 60] functionals for tetrahedral Pt4 cluster. Reina et al. applied LANL2DZ/M06 level of theory for small clusters of Cu, Ag and Au. Calibration of the method is done comparing experimental methods applying different functional and basis sets (Table 1). Results using PBE functional are nearer to the experimental data. For example, N–H and N–N bond lengths for isolated hydrazine are 1.024–1.029 Å (1.021 ), 1.438 Å (1.449 Å ), and for Ni2 is 2.123 Å  (2.15 Å ) as reported in our earlier paper. The binding or adsorption energy (Eb) of N2H4 on the cluster is calculated from Eq. (1). The synchronous transit-guided quasi-Newton (STQN)  method was used to determine transition state (TS) geometry which is verified by the presence of a single imaginary frequency. Transition states (TS) were correlated with the initial states (IS) and dissociation states (DS) by intrinsic reaction coordinate (IRC) plot. The electronic energy barrier for each step is calculated from Eq. (3). where qi occupancy of the donor, ɛi and ɛj are diagonal elements and F(i, j) is the off-diagonal element. All the molecular geometries and orbitals are shown in GaussView package . The optimised adsorption geometry and calculated energies on Ni4 cluster are presented in Fig. 1c and Table 2, respectively. The calculated Gibbs free energy and heat of reaction are negative indicating adsorption is a thermodynamically feasible and exothermic reaction at normal conditions. Since both the N atoms are chemically equivalent, the two Ni atoms are bonded cis fashion at bridging site on Ni4 cluster forming a rectangular geometry. Ni–N bond distances are 1.959 and 1.958 Å. The structure of adsorbed hydrazine is distorted gauche conformer, where N–H and N–N bond distances are elongated to (1.027 Å, 1.03 Å) and 1.508 Å, respectively. The calculated adsorption or binding energies of hydrazine are − 1.56 eV on Ni4 cluster, − 1.28 eV on Pt4 cluster  and − 1.86 eV on Ir6/alumina , but 0.52–0.80 eV on bridging position of Ni (111) surface , indicating that clusters bind hydrazine more strongly than surfaces which can favour dissociation. For example, corner atoms of Shell 405 nanoparticles can decompose hydrazine more efficiently than bulk Ir (111) surface . The Kohn–Sham MOs of the Ni4 cluster are shown in an earlier study , and MOs of isolated gauche hydrazine are presented in Fig. 1a. The MOs of the adsorption interaction are shown in Fig. 2. There are seven MOs from − 22.75 to − 11.46 eV, where valence electrons (VEs) of hydrazine delocalise, and from − 10.83 to − 5.52 eV, VEs of Ni4 cluster delocalise to the virtual MOs of hydrazine. From NBO analysis, it appears that for isolated N2H4 molecule, the two N–H bond (BD) pairs are slightly different. One pair is upward to the N atoms’ plane for the gauche isomer (Fig. 1b), and occupancy and hybrid nature of N for upward N–H bond pair are 1.99571 (sp2.95, 74.46% p). For the opposite bond pair, the corresponding values are 1.99287 (sp2.94, 74.45% p), respectively. For N–N bond, occupancy is 1.99813, hybridisation of both N atoms being (sp2.86, 73.85% p). The two lone pairs N(LP) have the same occupancy 1.97097 and hybridisation (sp3.2, 75.97% p). From natural population analysis during adsorption, charge transfer to the cluster is − 0.17 eV, indicating dissociation of N2H4 is favourable at standard conditions. This result is similar to what was found in an earlier study . NBO analysis for adsorption system (Fig. 1c) suggests that occupancies are 1.98970 for the upward N–H bond pair and 1.98102 for the opposite N–H bond pair. Hybridisation of the two entities is (sp2.81, 73.68% p) and (sp2.64, 72.47% p), respectively. For N–N bond, the occupancy is 1.99562 and the hybridisation of N being (sp3.51, 77.54% p). Two lone pairs N (LP) have occupancies 1.83205 and 1.83178 and have the same hybridisation (sp3.14, 75.81% p). Thus, the occupancy of the lone pair N(LP) of hydrazine decreases (-0.13 e) during adsorption, due to delocalisation of the lone pairs to the higher energy states of the cluster, indicating major charge transfer takes place from the lone pair orbital. The second-order Fock matrix analysis is presented in Table S1 of Supporting Information. The lone pair of each N atom is found to delocalise to empty valence orbital of Ni4 cluster, e.g. N1(LP) → Ni1(LP)* and N2(LP) → Ni2(LP)*. The delocalisation energies (DE) are 15.07 and 15.10 kcal/mol, respectively. 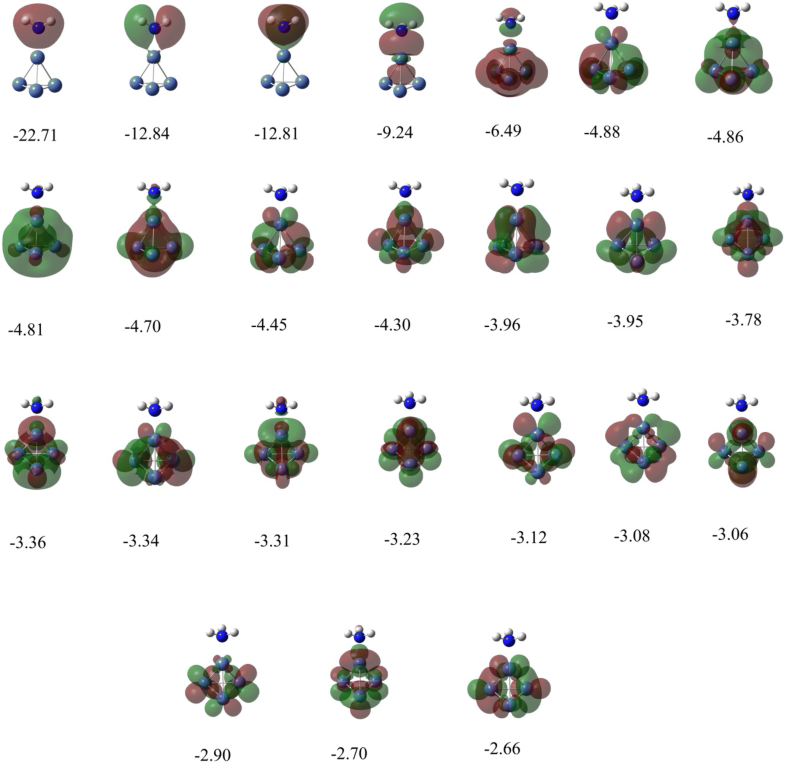 Again, lone pairs of the cluster delocalise to Rydberg orbitals of N. The delocalisation energies (DE) for Ni1(LP) → N(RY)* and Ni2(LP) → N(RY)* are 4.18 and 4.08 kcal/mol, respectively. Thus, hydrazine is adsorbed to Ni4 cluster by strong delocalisation energy of the lone pairs of N atoms, although no bond formation is observed between them at the adsorption state. The N–H and N–N bonds delocalise to the vacant LP* orbitals of the clusters at 3.54 kcal/mol and 4.70 kcal/mol, respectively, indicating weakening of the bonds, making dissociation favourable on the Ni4 cluster. The lone pair of both N (LP) atoms delocalise to Rydberg orbital of H (RY)*. The delocalisation energy of N1(LP) → H1(RY*) is 0.74 kcal/mol which increases N–H bond strength, but N1(LP) → N2(RY*) or N2(LP) → N1(RY*) delocalisations are diminished during adsorption. However, for isolated hydrazine, delocalisation energies for N1(LP) → H1(RY*) and N1(LP) → N2(RY*) are 0.63 kcal/mol and 1.30 kcal/mol, respectively, indicating that during adsorption N–N bond becomes weaker. Thus, the cleavage of N–N bond is easier than N–H bond due to adsorption. The two pathways of dehydrogenation of hydrazine on Ni4 cluster are discussed, and their energies and potential energy surfaces are presented in Table 2 and Fig. 4, respectively. 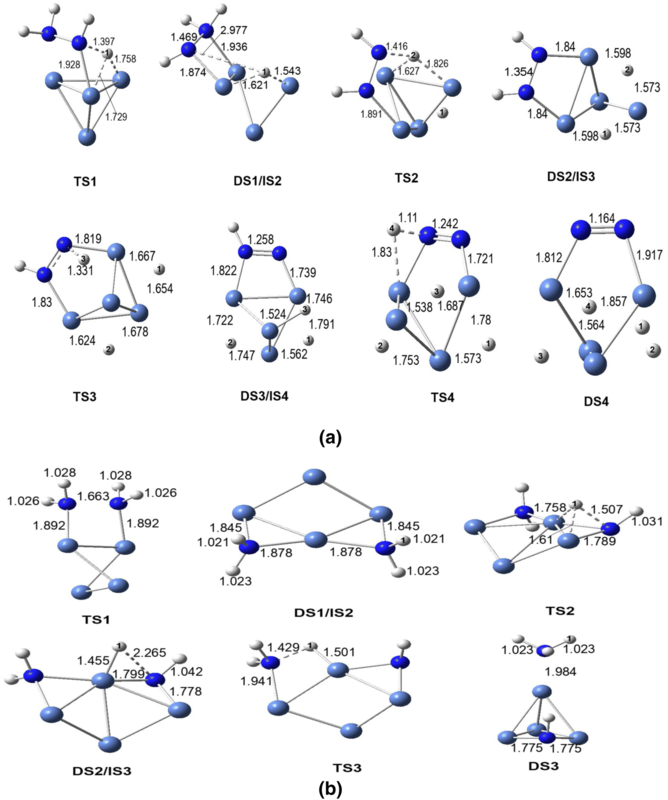 The adsorption geometry of hydrazine on Ni4 cluster (in Fig. 1c) is considered as the initial state 1 (IS1) for both path A and path B.
Dissociation geometries are presented in Fig. 3a. Four sequential elementary steps of N–H bond dissociation are discussed. In step 1, N2H4 → N2H3 + H, where the dissociation of N1–H1 bond on adjacent b2 site elongates to 1.397 Å at transition state (TS1) and 2.977 Å at dissociated state (DS1), forming N2H3 species by bond Ni1–N1(1.874 Å) on the cluster. The activation barrier for this step is 0.43 eV, whereas the value is 0.71 eV on Ni (111)  for gauche isomer. In step 2, dissociation of second N2–H2 bond leads to the formation of diimide; the elementary step is: N2H3 + H → N2H2 + 2H. The dissociation of N2–H2 bond takes place on adjacent b2 site which elongates to 1.416 Å and 3.047 Å at TS2 and DS2, respectively, forming diimide (N2H2) as shown in DS2, Fig. 3a. The calculated activation barrier is 1.19 eV, and on Ni(111) surface, the value is 0.85 eV . In step 3, the elementary step is: N2H2 + 2H → N2H + 3H. Dissociation of N1–H3 bond takes place, which is elongated to 1.331 Å and 3.014 Å at TS3 and DS3, respectively, forming N2H species. It binds through Ni1–N1 bond, and double bond character arises at TS3. The calculated activation barrier is 0.42 eV. On Ni(111) surface; however, the process is exothermic by − 0.26 eV and the activation barrier is 0.91 eV . For step 4, N2H + 3H → N2 + 4H, dissociation of N2 − H4 bond takes place, which is elongated to 1.11 Å and 2.544 Å at TS4 and DS4, respectively. This step is the most exothermic, with ΔH of − 2.74 eV and dissociation barrier of 0.71 eV. This is similar to Ni(111) surface study, where the process is exothermic by -0.93 eV, having a moderate barrier of 0.80 eV . The N–N bond distance gradually decreases from 1.508 Å (adsorption state), 1.469 Å (DS1), 1.354 Å (DS2), 1.258 Å (DS3) to 1.164 Å (DS4) during dissociation of N–H bonds. These values follow the same order with Ni(111) surface study . Therefore, Ni4 cluster can efficiently bind and decompose hydrazine as bulk Ni(111) surface. The adsorbed N2 binds at a cis pattern, N–Ni bond distances being 1.917 and 1.812 Å. The elementary step 2 is the rate-determining step which shows the highest activation energy barrier of 1.19 eV, as both Ni1–N1 and N2–H2 bonds break simultaneously. The NBO analysis for dissociation in path A is given in Table S1, Supporting Information. At dissociation state 1 (DS1), N2H3 species binds to the cluster with Ni1–N1 σ-bond, with occupancy of 1.86865 (27% Ni +73% N). The hybridisation of Ni1 is (sp0.18d1.93, 62.02% d) and of N1 is (sp11.18, 91.51% p). The occupancy of N1–H3, N2–H2 and N2–H4 bonds is 1.97228, 1.98354, 1.98179, respectively. Hybridisation of N atoms is (sp3.50, 77.47% p) (sp2.92, 74.46% p) and (sp3.17, 75.98% p), respectively. For N1–N2 bond, occupancy is 1.99461. Hybridisation of N1 is (sp4.58, 81.75% p) and of N2 is (sp2.92, 74.46% p). The occupancy and hybridisation for LP of N1 are 1.87252 and (sp0.92, 47.91% p), respectively. The values for N2 are 1.72635 and (sp2.98, 74.88% p), respectively. At dissociation step 2 (DS2), N2H2 species binds on the cluster by two diagonal σ-bonds. The Ni2–N1 bond has occupancy of 1.85438 (67% Ni + 33% N), with hybridisation of N1 sp73.22 (98.54% p). The Ni1–N2 bond has occupancy of 1.85358 (67% Ni + 33% N), with hybridisation of N2 sp73.23 (98.54% p). In dissociation state 3 (DS3), N2H binds with Ni1–N1 bond, with occupancy 1.96995 (58% Ni + 42% N). Here, hybridisation of Ni1 is (sp2.57d99.99, 99.67% d) and of N1 is (sp23.19, 95.44% p). Again, a N1–N2 σ-bond forms with occupancy 1.99535, hybridisation of N1 being (sp2.48, 70.92% p) and of N2 being (sp1.92, 65.67% p). Similarly, formation of a N1–N2 π-bond occurs, with occupancy 1.97075, and hybridisation sp99.99 for both N atoms (99.60% p). For dissociation state 4 of N2 (surface), a N1–N2 σ-bond forms, with occupancy 1.99634. Hybridisation of N1 is (sp1.78, 63.77% p) and of N2 is (sp1.68, 62.53% p). The two π-bonds have occupancy and hybridisation of 1.98143 (sp99.99, 99.64% p) and 1.89708 (sp99.99, 99.98% p) for both N atoms. Occupancy for the lone pair of N1(LP) is 1.83504, with hybridisation (sp0.56, 35.84% p). For N2(LP), the corresponding values are 1.81529 and (sp0.59, 37.23% p). Thus, after four sequential N–H bonds in dissociation of hydrazine, π-character of bond orbital (BD) increases and s character of the lone pair (LP) of N atoms increases. In steps 2 and 4, dissociation of two bonds, e.g. (N2–H2, Ni1–N1) and (N2–H4, Ni1–N1), takes place simultaneously. This causes higher activation energy for both the steps. But step 4 requires less dissociation energy barrier than step 2 due to change of hybrid nature of the Ni1–N1 σ-bond, i.e. p character of N1 (sp11.18, 91.51% p) for N2H3 species and (sp23.19, 95.44% p) for N2H species. Ab initio MOs for the dissociation steps DS1–DS4 are presented in Figure S1-S4, Supporting Information. N2 molecule binds at bridging site by σ-type overlap of (s + dz2) at -14.64 eV, with few π donor and acceptor interactions, indicating N2 is strongly bound to the cluster. Dissociation geometries are presented in Fig. 3b. In step 1, N2H4 → NH2 + NH2, the adsorbed hydrazine is dissociated to two NH2 species binding on two adjacent bridging sites. N − N bond distance is extended to 1.663 Å at TS1 and 3.642 Å at DS1. In step 2, NH2 + NH2 → NH2 + NH + H, dissociation of NH2 to NH and H takes place. The dissociated NH bond is elongated to 1.507 Å and 2.265 Å at TS2 and DS2, respectively. In step 3, NH2 + NH + H → NH3 + NH, the adsorbed H is transferred to nearest NH2 species to form NH3 molecule. The new N–H bond forming distances at TS3 and DS3 are 1.429 Å and 1.029 Å, respectively. However, step 2 or dissociation of NH2 species is the rate-determining step, with calculated activation barrier of 1.71 eV. Yin et al. calculated N–N bond dissociation barriers as 0.49, 0.36, 1.08 eV for anti, cis and gauche isomer, respectively, on Ni(111) surface. All these values were exothermic. Since both the N atoms are bonded to the surface for the cis isomer, N–N bond length is increased to 1.485 Å and favours dissociation. However, N–N distance was observed as more stretched on Ni4 cluster, the value being 1.508 Å. Dissociation barrier for gauche isomer which adsorbed in cis fashion is 0.02 eV. But the formation of ammonia can be slow due to the higher dissociation energy barrier for step 2 in path B. The NBO analysis for path B is given in Table S2, Supporting Information. At DS1, two NH2 species are co-adsorbed. Occupancies of two pairs of N–H bonds are 1.98405 (N1–H1, N2–H4) and 1.98925 (N1–H3, N2–H2). Hybridisations of N1 are (sp2.76, 73.32% p) and of N2 is (sp2.51, 71.44% p). Two pairs of LP on N1 have occupancies 1.69589, 1.60794 and hybridisation of LP1 (sp36.86, 97.34% p) and LP2 (sp1.37, 57.52% p), respectively. Another two pairs of LP on N2 have occupancies 1.69578, 1.60796 and hybridisations of LP1 as (sp37, 97.34% p) and of LP2 as (sp1.37, 57.70% p), respectively. Therefore, more number of lone pairs can slow down the N–H bond dissociation due to repulsive nature of the electrons. In DS2, NH2 species binds by Ni2–N1 bond, with occupancy 1.90511 (22% Ni + 78% N). The hybridisations are: Ni2 (sp0.87d1.59, 46% d) and N1 (sp2.72, 73.06% p). NH species forms Ni2–N2 and Ni3–N2 bonds, with occupancies 1.78902 (35%Ni + 65%N) and 1.84171 (32%Ni + 68%N), respectively. The hybridisations are: Ni2 (sp2.8d4.99, 57% d), N2 (sp10.42, 90.84% p), Ni3 (sp0.1d1.54, 60% d), N2 (sp8.10, 88.54% p), respectively. The lone pair of N1 (LP) has occupancy 1.65751 and hybridisation (sp3.90, 79.55% p). Corresponding one of N2 (LP) has occupancy 1.84402 and hybridisation (sp0.70, 41.14% p). At DS3, NH3 (adsorbed) has three N–H bond of occupancies 1.99229 (N1–H1), 1.99256 (N1–H2) and 1.99256 (N1–H3). The hybridisations of N are (sp2.69, 72.81% p; sp2.70, 72.90% p; sp2.70, 72.90% p), respectively. The LP of N1 has occupancy 1.84459 and hybridisation (sp4.32, 81.20% p). Moreover, NH species binds with Ni2–N2 of occupancy 1.90377 and hybridisation of N is (sp10.52, 91.13% p). For N2–H4 bond, occupancy is 1.78543 and hybridisation of N2 is (sp41.22, 97.38% p). LP of N2 has occupancy 1.83962 and hybridisation (sp0.52, 34.01% p). Both NH2 species get co-adsorbed (DS1) to the cluster by strong delocalisation of two lone pairs of each N atom. This is shown as N1(LP1) → Ni1(LP*)/Ni2(LP*). The energy values are 12.32 and 41.45 kcal/mol, respectively. In co-adsorption of NH2 and NH species (DS2), delocalisation energy of N1(LP) of NH2 species is 40.09 kcal/mol. Corresponding value for N2(LP) of NH species is 23.39 kcal/mol. At DS3, lone pairs of NH3 and NH species (DS3) bind to the cluster by 21.16 and 17.90 kcal/mol, respectively. Thus, NH species strongly binds to the cluster forming two Ni–N bonds with strong delocalisation energy. These are highly stable on the cluster. Huang et al. observed the formation of diimide (N2H2) on Ni(100) surface from 200-450 K and proposed that the formation occurs due to recombination of two NH species. But, Yin et al. proposed that diimide formation takes place via N2H4 → NH2 + NH2 → NH + NH → N2H2 which is energetically unfavourable process, with EAct 1.32 eV. Thus, there will be a competition between two routes of dissociation and production of hydrogen will be lower. Similar results are obtained on Ni(111) surface by Yin et al. . It was proved experimentally that 52% H2 selectivity takes place over nickel nanoparticles supported on carbon from 50 to 60 °C, with rate of the reaction around 10–20 h−1. Therefore, the values computed with the Ni4 cluster in the present case compare favourably with previous calculations and experimental results. The Ni4 cluster is thus a plausible model to study reactivity of hydrazine on Ni nanoparticles. 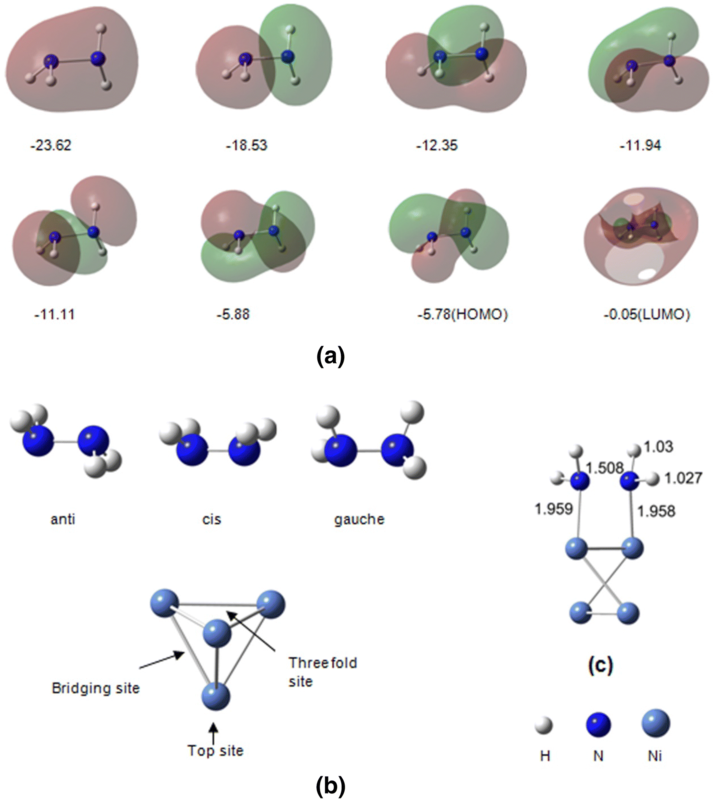 To understand the fate of ammonia formed during hydrazine decomposition, the adsorption and dissociation geometries of NH3 on Ni4 cluster were considered, as shown in Fig. 6. It has been observed that both adsorption and dissociation are thermodynamically favourable processes. The energy values are represented in Table 2. The occupied MOs of NH3 act as a donor from − 22.71 (weak), − 12.84 (strong) and − 12.81 eV (strong), whereas one strong acceptor overlap occurs at -9.24 eV, as shown in Fig. 5. From NBO analysis, NH3 appears at isolated state, with three N–H bonds, having occupancy 1.99932, hybridisation of N being (sp2.98, 74.79% p). There is also a lone pair N (LP) with occupancy 1.99554 and hybridisation (sp2.98, 74.77% p). For adsorption state, the three N–H bonds have occupancy (1.99091), with hybridisation of N as (sp2.62, 72.34% p). But occupancy of the lone pair N (LP) greatly decreases to 1.83833 with hybridisation (sp4.62, 82.20% p). However, from the second-order Fock matrix analysis, as presented in Table S3 (Supporting Information), the lone pair of the N atom delocalises to higher energy states of Ni1, e.g. N1(LP) → Ni1(LP)*. The delocalisation energy (DE) for the step is 22.34 kcal/mol and for Ni(LP) → N(RY), DE 4.46 kcal/mol, indicating N of ammonia is a strong donor and a weak Rydberg acceptor. Moreover, the lone pair delocalisation energy for N(LP) → H(RY*) decreases from 1.48 kcal/mol (for free NH3 molecule) to 1 kcal/mol, indicating weakening of N–H bond. The calculated adsorption energy is -1.30 eV, same as that on Ni13 cluster . The formation of NH2 is the rate-determining step. Dissociation of ammonia is a three-step process: NH3 → NH2 + H → NH + 2H → N + 3H. Adsorption of ammonia is the initial state 1 (IS1) for the dissociation process, as shown in Fig. 6. 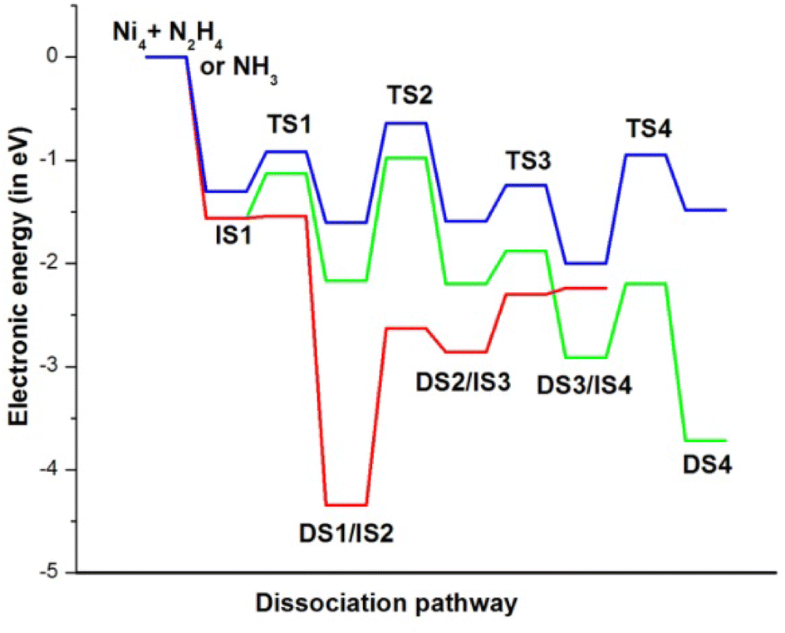 However, second step (DS2) or dissociation of NH2 species is the rate-determining step, with Eact of 0.96 eV. The potential energy plot is represented as blue line in Fig. 4. However, after complete dissociation of ammonia, resulting surface N formed as nitride, observed as tridentate ligand in threefold site of the Ni4 cluster. The MOs are shown in Figure S5 (Supplementary Information). The nitride can reduce activity of the Ni catalyst. Thus, Plana et al. reported that 100% conversion of ammonia requires high temperature at 880 K applying Ni catalyst supported on alumina-coated cordierite monoliths. Moreover, formation of N2 is a thermodynamically feasible process, but the activation energy barrier is quite high at 1 eV. The co-adsorption of two N atoms is considered as the initial step for N2 formation. Thus, although the dehydrogenation of ammonia thermodynamically feasible process, nevertheless, the formation of ammonia from hydrazine and dehydrogenation of it is a lengthy process due to more number of higher activation energy barriers. NBO analysis for NH3 dissociation (in Figure S3, Supporting Information) provides the following information. At dissociation state 1 (DS1), NH2 species binds forming Ni1–N1 bond, with occupancy 1.90894 (29%Ni + 71%N). The hybridisation of Ni1 is (sp0.12d1.13, 50% d) and of N1 is (sp3.02, 75.07% p). The two N–H bonds have occupancies 1.99192 and 1.98686, and hybridisations of N as (sp2.59, 72.11% p; sp2.66, 72.64% p), respectively. The lone pair N(LP) is of occupancy 1.76781 and hybridisation sp4.0 (79.96% p). At DS2, NH species binds with Ni1–N1 bond, with occupancy 1.96452 (50% Ni + 50% N). Hybridisation of Ni1 is (sp0.95d74.54, 97.45% d) and of N is (sp1.86, 50.41% p). The N–H bond has occupancy 1.96532 and hybridisation (sp2.16, 68.27% p). The two N(LP)s are of occupancy 1.72169 and 1.51578, with hybridisations (sp1.99, 66.55% p) and (s0p1, 99.94% p), respectively. 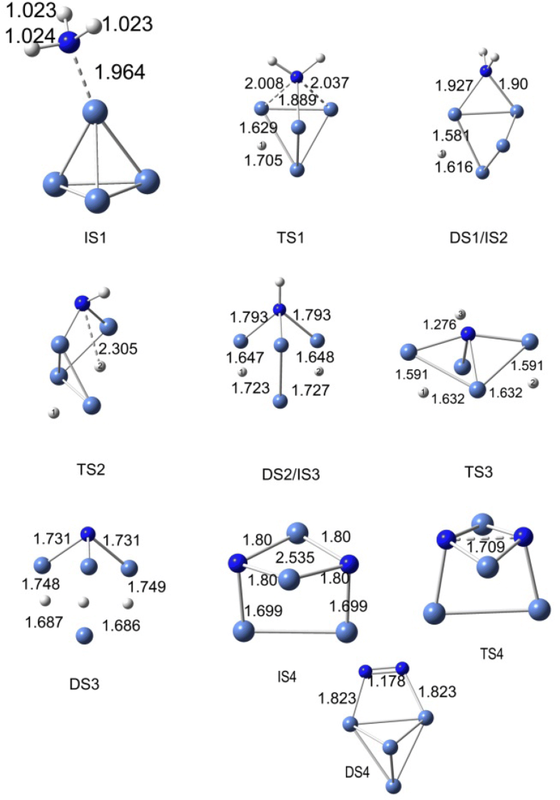 For DS3, N species binds to the cluster with three Ni–N σ-bonds, having similar occupancy 1.99024 (57%Ni + 43%N) and hybridisation of Ni (sp0.45 d99.99, 99.22% d) and of N (sp24.70, 95.58% p). A lone pair (LP) is also formed, with occupancy 1.76486 and hybridisation (sp0.12, 10.95% p). Thus, N species binds to the surface by three Ni–N bonds, indicating higher heat of dissociation will be required to remove the N2 gas from the surface of the catalyst. The lone pair of each N atom for NH2, NH and N delocalises to higher energy states of Ni4, N(LP) → Ni(LP*). The delocalisation energy for NH2 is 35.03 kcal/mol; for NH species two lone pairs, delocalisation energy values are (28.19, 29.95 kcal/mol) and (19.67, 22.03 kcal/mol). For N species, three delocalisation energies are identical at 24.02 kcal/mol. Adsorption and dissociation of hydrazine and ammonia on Ni catalyst are simulated on a Ni4 cluster as a finite surface prototype model for Ni catalyst, using density functional theory. Hydrazine binds to Ni4 cluster by cis fashion coordinating two Ni atoms, and NH3 binds at the top site of the Ni4 cluster. Adsorption of both the molecules is due to strong delocalisation of the lone pair of nitrogen to higher energy states of the cluster. The delocalisation energy (DE) values are 15.07 and 15.10 kcal/mol for hydrazine and 22.34 kcal/nol for ammonia. The N–N bond distance of hydrazine increases from 1.438 to 1.508 Å due to absence of delocalisation of the lone pair N1(LP) → N2(RY*) or N2(LP) → N1(RY*) during adsorption. Dissociation of N–N bond is easier than of N–H bond due to strong donor–acceptor interaction via LP of two N and Ni4 clusters and absence of delocalisation of N1(LP) → N2(RY*) or vice versa during adsorption. For free hydrazine, the DE value is 1.30 kcal/mol. In path A, steps 2 and 4 show higher activation energy barriers at 1.19 eV and 0.71 eV due to dissociation of N–H and Ni–N bonds. Step 2 is the rate-determining step. Ni–N bond at DS1 or IS2 is spd hybrid, whereas for DS3 or IS4, it has mostly pd character. In path B, step 2 or dissociation of a NH2 species, 2NH2 → NH + H + NH2, is the rate-determining step, with activation barrier of 1.71 eV. This is due to repulsive nature of two NH2 species having two lone pairs present on each N atom. All the processes are thermodynamically feasible. Formation of N2 is a highly exothermic process, with ΔH − 2.74 eV. Dehydrogenation of hydrazine through path A is easier than through path B, because the species formed throughout the process are N2H3, N2H2 and N2H and finally N2. Each N2H3 or N2H species binds to the cluster by one Ni–N bond. N2H2 species binds to the cluster by two diagonal Ni–N weak bonds. Therefore, dissociation of these intermediates is easier. Finally, surface N2 binds to the cluster by lone pair delocalisation, with DE values as 45 and 55 kcal/mol. No Ni–N bond formation has been observed, and removal of N2 will be easier. In path B, co-adsorption of two NH2 species and two lone pairs on each N atom is repulsive in nature causing higher N–H bond dissociation energy barrier. Although ammonia formation needs higher activation barrier, NH formed in the final step binds the cluster by two Ni–N bonds. Therefore, removal or dissociation of the NH species may require higher energy barrier. Thus, N–N bond rupture can slow down the cell performance due to formation of not only ammonia as a lengthy process of dehydrogenation but also formation of surface N as tridentate ligand which strongly binds at the three-fold site of the cluster. N species binds to the cluster by three Ni–N bonds. This investigation can be a clue for the future design of a perfect dehydrogenation catalyst for hydrazine. The authors gratefully acknowledge infrastructural support from DST-FIST and UGC-SAP grants to the Department of Chemistry, KU, and from DST-PURSE grant to the Faculty of Science, KU, for this research work.